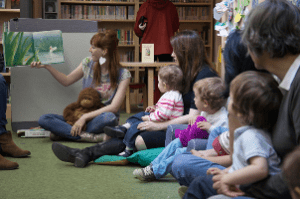 Songs, rhymes and stories in English for the very young. Our Toddler Time is for children ages 1-3 and their guardians. The program lasts 30 minutes and features songs, hand-rhymes and short stories in English. Parents and caregivers are expected to sit on the floor with their children beside them or in their laps and participate in the program. REGISTRATION REQUIRED! Click HERE to register for the 10h30 Toddler Time. Click HERE to register for the 17h00 Toddler Time. Questions can be sent to our children’s and teens’ services manager, Celeste: celeste@americanlibraryinparis.org. All children must be accompanied by an adult lap and registration is required. Children attending programs must have their own library card, or be covered by a family membership, otherwise the non-member fee applies. All programs are free for Library members and 10€ per child for non-member children. Caregivers are expected to familiarize themselves with these guidelines so that we can provide a pleasant library environment for all patrons.